Often looked upon as the forgotten reservoir, Draycote regulars are happy for it to stay that way. For the Midlands venue has produced stunning sport from bank and boat for the past two seasons. Local tackle dealer and guide Gary Lyttle reveals his favourite bank marks. DRAYCOTE Water may not receive the publicity that is heaped upon Midland rivals Rutland and Grafham, but the reservoir must now rank as one of the top bank venues in the country, consistently producing silvered-up fish. Situated in the heart of England, in picturesque Warwickshire, the fishery can easily be accessed from the M6 and M1 motorways, which are both just a few minutes away. For those who wish to stay overnight, the nearby pretty thatched village of Dunchurch offers a variety of hostelries together with a good choice of places to eat and drink. One of the big advantages of Draycote, especially for the bank angler, is the perimeter road, which enables anglers to recce the area before choosing where to fish. The road also provides close parking to the water’s edge all round the reservoir providing easy access to the lake’s many bays, points and peninsulas. When it comes to tactics, all methods have their day, but the locals will probably tell you that floating line with Buzzers and nymphs will outscore the lure men and tends to pick up better-quality fish. I am predicting that the sport during this season’s fry feeding will be the best for many years. Massive shoals of fry, larger and more fish being stocked, plus an increase in popularity in catch and release, add up to nothing less than a back-end bonanza. Favourite spots to try will be Hensborough Bank, Inlet, Valve Tower, Dunns Bay and the boat dock. I wouldn’t be surprised to see records fall this Autumn! Before planning a trip you can find up-to-date information on our website, including weather cam, wind barometer charts, catch reports and tips on flies to use: www.lyttlesofdunchurch.co.uk. Or visit me at the shop in Dunchurch on your way down to the lodge. Let’s go on a tour of the bank. After picking up our tickets from the lodge, it is always worth asking what’s going on where. Keith and Margaret Causer are always glad to advise new visitors to the water. 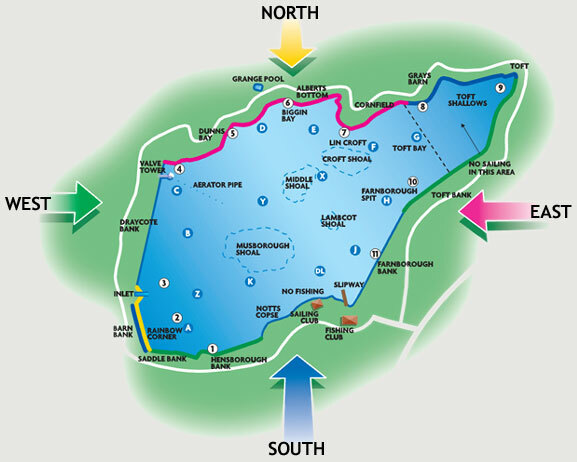 We will take a clockwise drive around the reservoir, starting from the fishing lodge. There is no fishing permitted along the sailing club and picnic bank but fishing commences at the first car park where a fence extends out into the water – clearly indicated on the maps which are freely available. BECAUSE it is sheltered by woodland and dam walls, the visiting bank angler can always find somewhere to get out of a strong wind. The only tricky wind is a stiff south-easterly. A cold north-easterly in early season can kill sport dead while a warm south-westerly in late Spring and early Summer will bring fish up to the surface. At the time of writing in early August, the reservoir’s level was about five feet down which encourages more weed to grow in the shallower margins as the light can penetrate easier. Some algae also appeared at the start of the hot weather but the cooler winds of Autumn will soon disperse it. If the offshore shoals become exposed, this is where the boat angler should head for late-season sport with fry feeders. Hensborough Bank starts adjacent to the car park, with a small area of natural bank leading onto the dam wall. This bank does not tend to get a lot of pressure, especially along the dam wall. Fish of fairly exceptional quality can be caught here and quite close to the bank. My favourite area is on the stones in front of the overflow, especially during May when there is still a good level of water in front of you. With no obstruction behind, it means you can get a huge line out and fish a lot of water. The second largest car park is also situated here. BEST METHODS: Floating line, nymph and buzzer. Fry patterns back end. BEST TIMES: Early until June, then September to October. WADEABLE? Not necessary in high levels. Saddle Bank is the area leading into Rainbow Corner, similar in character to Hensborough. Again there is very little pressure on here but a nice westerly can produce some good nymph fishing. Another car park is adjacent to Saddle Bank about halfway along. At the end of the dam a small area of natural bank appears leading into a small bay known as Rainbow Corner; a very consistent bank which gets attention from locals and visitors alike. Although one of the well-known hot spots, it can get shallow and weedy July and August time. BEST METHODS: Saddle Bank - floater and intermediate, variety of lure and nymph. Rainbow Corner - floater and Buzzer. BEST TIMES: Early and late Spring into June. WADEABLE? Not necessary on Dam section. Barn Bank covers another section of dam wall heading north from Rainbow Corner – a favourite hot spot early season when northwesterly winds are blowing. 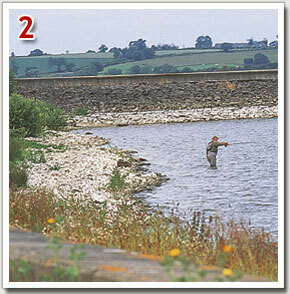 The two ends tend to fish best, as trout often travel up and down this dam, frequently circling a few times at each end. During late evenings in Summer, along the inlet end of the dam can produce some stunning over-wintered fish which come inshore from the Musborough Shoal, although usually you have got to stay very late for these. The inlet is a favourite Summer spot for dry fly and nymph anglers; wading is essential here as it is very shallow. Although a good area for buzzer and sedge, it can also produce excellent results for the dry fly angler when westerly winds blow terrestrials from the shoreline trees and shrubs onto the water. Right next to the inlet the dam wall starts again; this is called Draycote Bank. The area immediately adjacent to the inlet has a section of flat stones extending some 100 yards or so. This allows comfortable casting and is also another favourite with locals, but it can be a bit hit and miss. BEST METHODS: Early season intermediate and sinking shooting heads and lures on the dam. Good Buzzer and floater at Inlet when water warms up. BEST TIMES: April - June, then October. WADEABLE? Not applicable on dam section. Yes on inlet natural bank. The Valve Tower is one of the deepest areas for the bank angler to fish. One look at the surrounding contours will tell you why. The Valve Tower area itself is a firm favourite for back end fry feeders; the deep water on the grass bank can provide cooler water for trout during Summer and can fish well with all methods throughout. A short shooting head can be an advantage along this bank. BEST METHODS: Shooting head, floating intermediate and sinkers. Lures mainly, except during good buzzer hatches. Good Booby water when weather is hot. BEST TIMES: Good all season, but particularly good back end on fry. WADEABLE? No - too deep. Heading east from the Valve Tower we are on to the natural bank. This is the prettiest area of the reservoir and also provides the most consistent bank fishing. Dunns Bay starts at the fence by the pipe adjacent to a car parking area. This bay, along with Biggin Bay, has a fairly good depth of water just a short way out in early season and is another hot spot for all methods. It is also possible to park cars right next to the water. BEST METHODS: Locals will argue in favour of the Buzzer and floater. Use traditional flies in a wind, intermediate and sinking lines in adverse conditions. BEST TIMES: May and June. As we drive around Biggin Bay looking along the bank, a large peninsula comes into view called Lin Croft Point. Driving around the point you can see a very small parking area, enough for one angler right on the point. But carry on to the other side and a larger car park appears with a nice area of grass bank with no obstructions behind, thus allowing some comfortable fishing. The hot spot here has to be each side of the tree - a red hot favourite from April through to June for the Buzzer angler and a fairly reliable evening spot as swarms of buzzers come back onto the water from the trees on the point to lay their eggs. This insect activity pulls quality fish in from Croft and Middle Shoal in the late evening. BEST METHODS: Floater and Buzzers, traditionals in a wind. BEST TIMES: Mid April to end of June. WADEABLE? Yes - useful in low water but otherwise you do not need to and it may prove detrimental. Cornfield is my favourite bank, although it can get busy when the trout are really on the buzzer accompanied by a nice steady easterly. This is classic nymph water with a nice depth in the Spring of around ten feet at 30 yards. There is no real need to wade here, in fact it’s usually detrimental to your casting, but there’s always someone who will go charging in to start everybody else doing the same. A floating line and a box of Buzzers from opening day all the way through Summer is all you will ever need on this bank and, again, parking is really close to the water. This area would be a very good place for beginners and new visitors to try, with a favourable wind of course. BEST METHODS: Floater and Buzzer. BEST TIMES: April to July, good evening rises on sedge pupae in July to August. Depending on algae blooms in hot weather, May has to be the best month. The Cornfield section ends where the fence goes down and out into the water. Glance to your left and you can see some of the properties in the pretty village of Thurlaston that overlooks the water. The fence signifies the start of Toft Shallows. This is, as the name suggests, the shallowest area of the lake. It also has one of the largest areas of bank available with both a north bank and a south bank. Both areas are firm favourites - again a classic section of Buzzer water with some massive hatches of buzzer and sedge in the evenings. Weed can be a problem later in the Summer. A good bank for an evening rise, especially for dry fly addicts, from May onwards. This is possibly one of the most popular areas on the reservoir, year in year out, but if it is fishing well and looks too busy, then a walk along the dam wall on the south shore close by can be an excellent choice, plus you will have all the space you want, including an immediate increase in depth to play with. BEST METHODS: Floating lines, nymphs and dries. WADEABLE? Yes, but be aware of the rules regarding going over thigh level. Toft Bank leading up to the spit is one of my favourite dam wall spots. Casting can be awkward, and the dam is not the most comfortable place on the reservoir, so consequently it doesn’t get too much pressure. A nice south-westerly will see locals doing really well here, a noted area for producing big silvered-up rainbows, This is a place I associate with quality rather than quantity. Farborough Spit is a dog leg on the dam wall forming a narrow peninsula at the point; either side of this point is a food collection area for trout. BEST METHODS: All methods work equally well at various times of the year from fast sink lures in April to dry flies in Summer. Fish can be closer in than you think. BEST TIMES: Worth considering any time during favourable winds, especially if you want to get away from the crowd. Farborough Bank covers the final area as we head south along a straight section of dam wall towards the fishing lodge (pictured right). This bank can have its good days but it’s not one of my most consistent areas on the lake, although some of my best fry feeding sport has been on here, especially at the limit post by the boat dock. A Floating Fry here can be deadly. BEST METHODS: Deep-fished Buzzers early season and fry patterns later on. BEST TIMES: Early season, and then September to October.